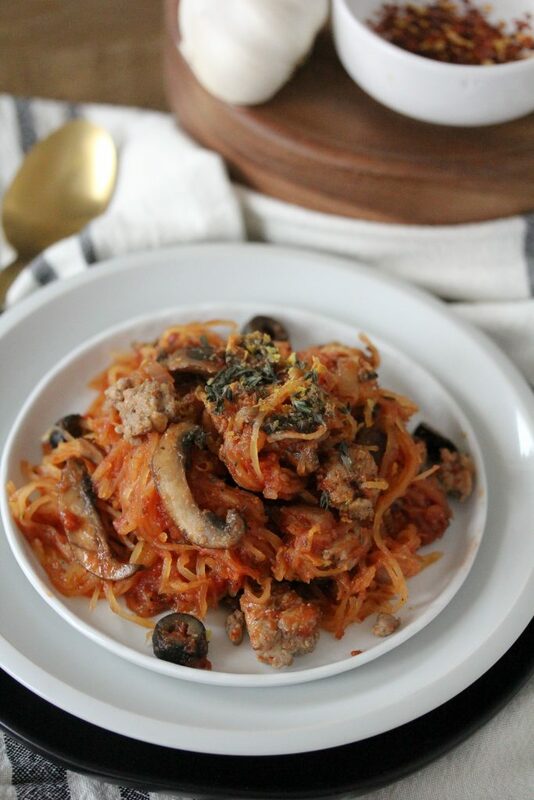 A Pizza Pasta from The Whole Smiths that’s sure to be a hit amongst the entire family. 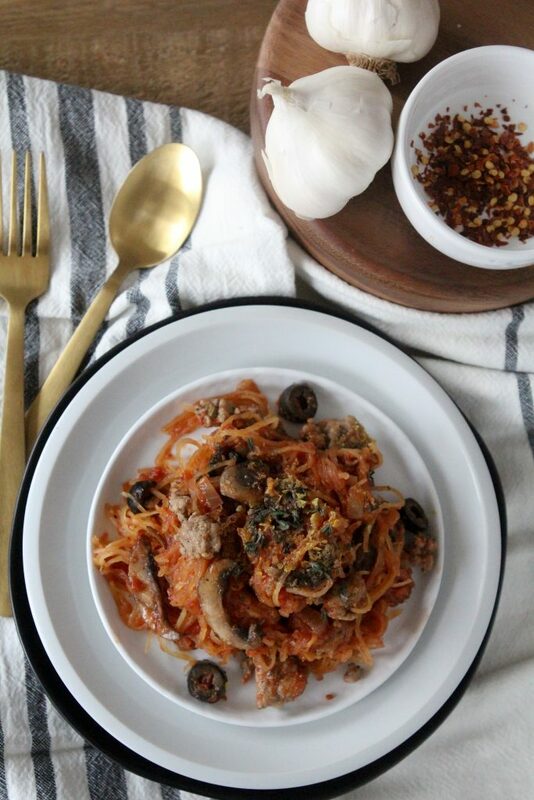 Not only is this “pasta” gluten-free and paleo, it’s Whole30 compliant thanks to the spaghetti squash. Pizza Pasta, say whaaaa? Yep, you heard that right. All of the flavors you love from pizza crammed into a healthy, veggie loaded version. If you’re looking for a kid-friendly Whole30 recipe, this is quintessentially it. As I type this recipe I’m on Day 7 of my who-knows-what round. 4th? So, apologies in advance for the lack of humor, cheekiness and brevity of this post. As the Whole30 timeline tells us, these few days can be a little rough in terms of energy and mood. And I’m gonna agree with that. But I really want to get this recipe to you ASAP so bear with me. Because I have yet to find a Whole30 compliant pepperoni (can somebody please get on that?) I opted to use Italian sausage in it’s place and go for the “combo”-style pizza. As far as finding Whole30 compliant sausage, you have a couple of options. One is you can easily make your own using ground pork. 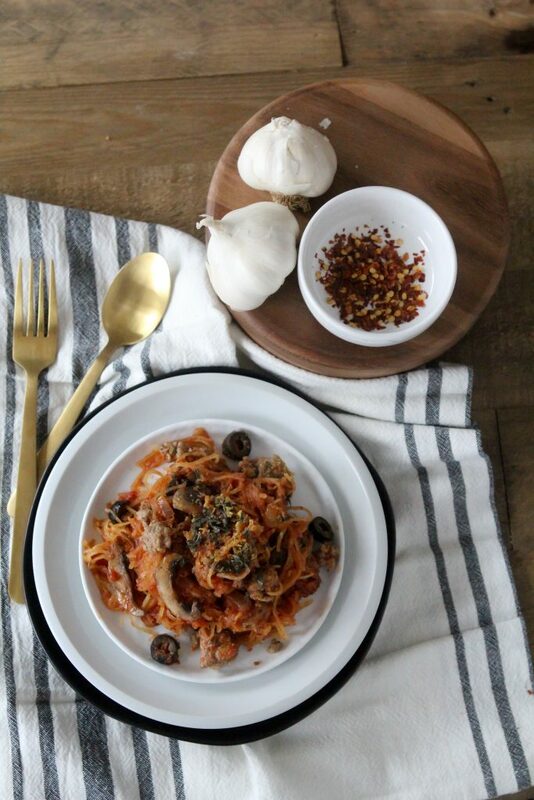 I have a recipe for Whole30 Italian Sausage here on my blog. All you need to do is add a few compliant seasonings. 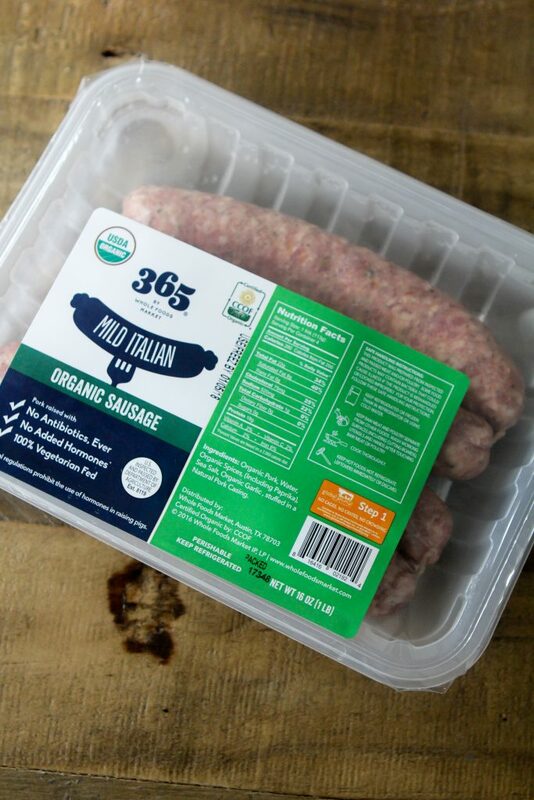 Whole Foods Market also sells a compliant Italian sausage under their 365 label, so keep an eye out for it on your next grocery run. And spaghetti squash. Everyone has their favorite ways to prepare it, mine is to roast it in the oven. I love the small bits of char and extra layer of flavoring I get on it by roasting it. But lots of you like to use your Instant Pot or even your microwave to prepare it and I say go for it. However best you like to cook up your squash, you do you girl. Or boy. The directions below show you how to roast the squash in your oven but feel free to ignore it if you’re wanting to cook it a different way, if won’t affect the outcome of the recipe. Does anyone even remember spaghetti squash while we were growing up? I certainly don’t. I didn’t have my first one until a couple of years back ago. Was it around but just not something we ate? Was it because we had the unsubstantiated value of healthy whole grains being shoved down our throats and were all carbo loading on regular ‘ol gluten-y pasta? Was it growing exotically in a rainforest somewhere only to be discovered in the last 10 years and finally made it’s way abroad? Really, I have no idea where it’s been my whole life. But it’s hear now and I use it in place of pasta all of the time. Like in my Spaghetti Squash Bolognese. I created a bolognese sauce that an Italian nona would love and poured it over spaghetti squash instead. She may not like that part. Regardless, it’s such a versatile ingredient and I stock up in the fall and winter as they tend to keep for quite some time. However, now that it’s become more popular I have an easier of a time finding it year around. So what do you think? Will you be adding this Spaghetti Squash Pizza Past into your Whole30 meal plans? Will your kids love it? Actually, I’ll answer that for you… yes and yes. 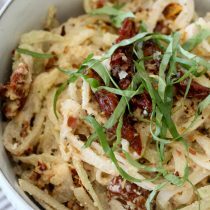 A Pizza Pasta from The Whole Smiths that's sure to be a hit amongst the entire family. 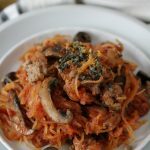 Not only is this "pasta" gluten-free and paleo, it's Whole30 compliant thanks to the spaghetti squash. Lightly coast the insides of the spaghetti squash with 1 tablespoon of olive oil and season with 1 teaspoon of salt and the black pepper. 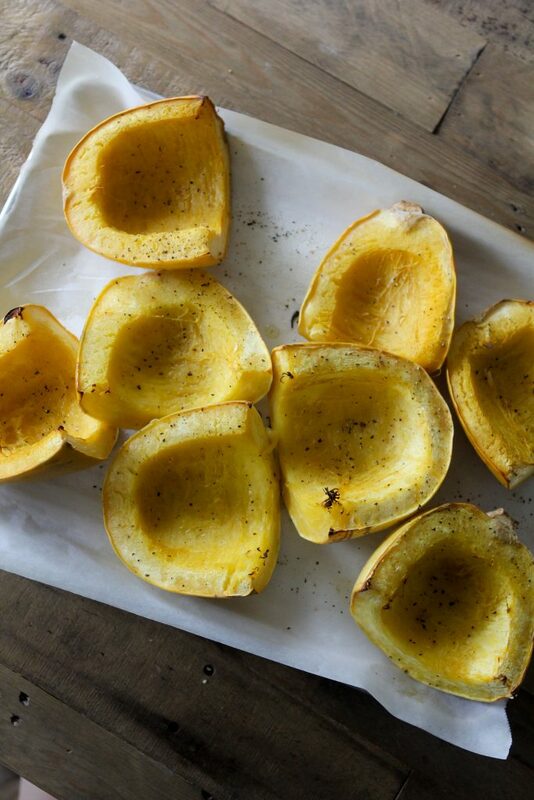 Place on a baking sheet and roast for 35 minutes, until the squash is tender and lightly charred on the edges. Meanwhile, heat a large pan over medium heat and add 1 teaspoon of olive oil to the pan. Once the oil is hot add the Italian sausage to the pan and brown gently breaking it up in the pan, about 6-7 minutes until cooked through. Once cooked through, remove the sausage from the pan and reserve in a bowl. 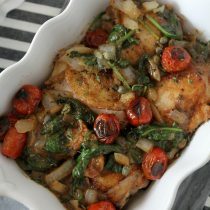 Add the chopped onion and bell pepper into the same pan and cook until tender, about 7-8 minutes. Remove the vegetables from the pan and add them into the bowl with the sausage. If the pan is dry add an additional teaspoon of oil to it and add the mushrooms. Cook until soft and tender, about 7-8 minutes, occasionally stirring. Add the sausage and vegetables back into the pan with the mushrooms once they are done cooking and reduce the heat to medium low. 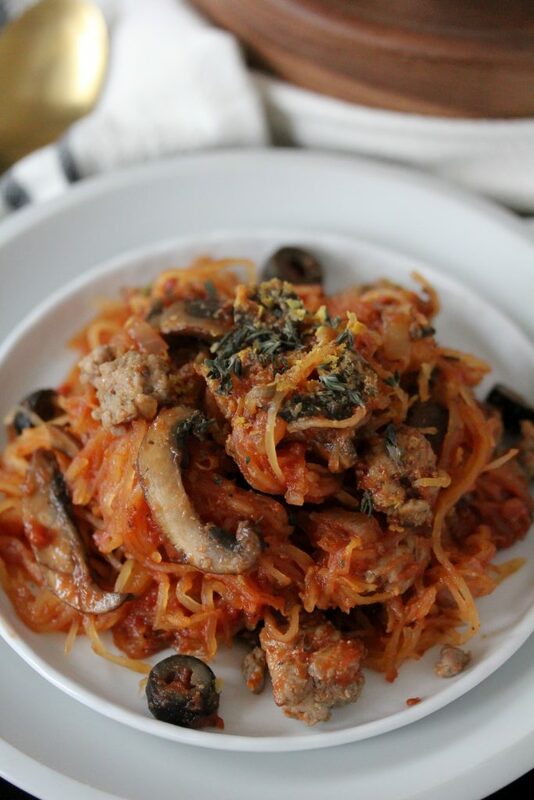 Scrape the insides of the roasted spaghetti squash into the pan with the sausage, onions and bell pepper. Add the pizza sauce and olives and toss to combine thoroughly. Heat through until warm. To serve, salt to taste and top with a bit of dried oregano, red pepper flakes and / or nutritional yeast. This was FABULOUS!! So good! And possibly better than the real deal– loved it! Couldn’t find “crimp” mushrooms so I used mini portobellos. Also, what type of canned pizza sauce do you buy? Couldn’t find anything so ended up using Rao’s Tomato Basil Sauce. I think it’s whole 30 compliant. Awesome dish– thank you! I made this tonight and it was absolutely delicious! My only complaint is that I didn’t have the stomach capacity to eat more! Thanks for sharing this great recipe! This was so good! Really satisfying for that pizza craving. I live in the UK and can’t ever get spaghetti squash – we don’t have it unless I grow it myself and…slugs. 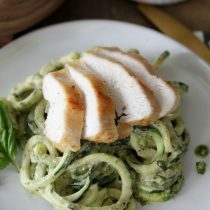 So is a good substitute zoodles? Or would you do something different? Thank you thank you for this recipe! I saw it on an Instagram post and made it the next week. My husband LOVES pizza so I knew I had to try this super healthy version – and it actually tasted like pizza! Also we’re veggie, so I substituted the regular sausage for the Tofurky Italian sausage and it was still super tasty. Thank you!